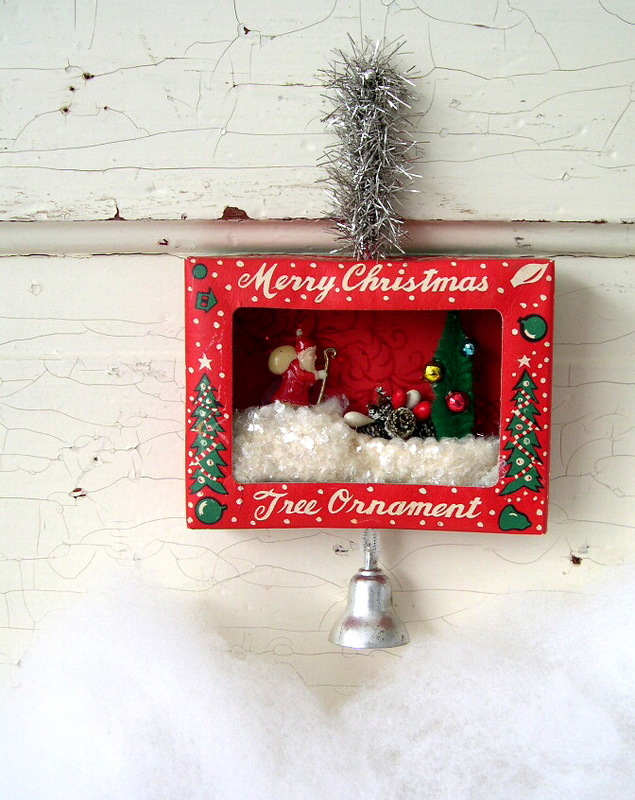 I don't know if it's all those years spent living in places where it doesn't snow or maybe it's the no-shoveling-required with these but snow and snowmen seem to be the theme of my growing collection of vintage Christmas decorations made by some very talented vintage Christmas crafters. I love every little thing about this winter scene, right down to that tiny mushroom. Created by Barbara over at Oodles and oodles who is busy today hosting The Academy of Vintage Christmas Ornament Arts and Sciences Awards ceremony. Be sure to stop by and see which vintage ornaments were this year's big winners. This happy little guy came home with me last year -- you may recognize him as one of Magpie Ethel's very charming creations. 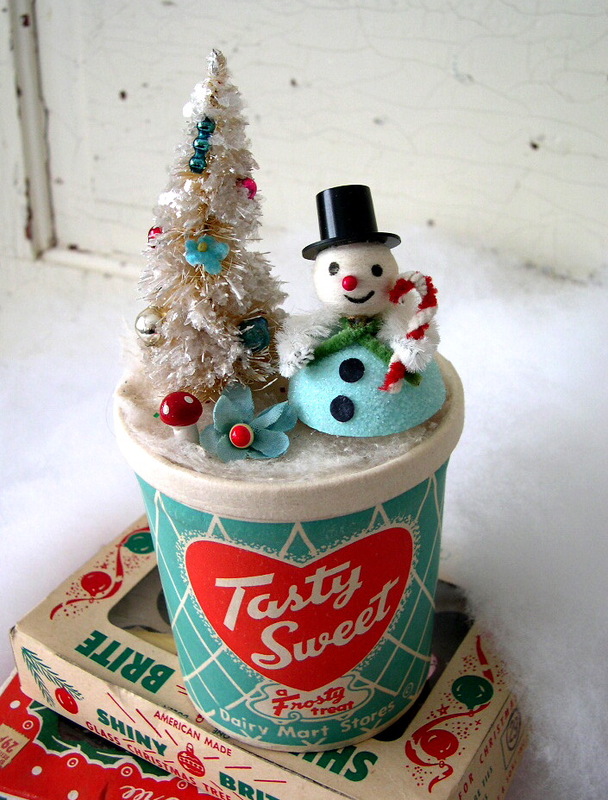 The multi-talented Suzy of GeorgiaPeachez created this kitschy-adorable Christmas scene. In addition to sewing and making jewelry, Suzy may be best-known during the holidays for her glorious vintage ornament wreaths. I don't know who made these little vintage snowmen but they were perched on the edge of a shelf at Goodwill and before I could stop them (as if), they had flung themselves into my shopping basket. 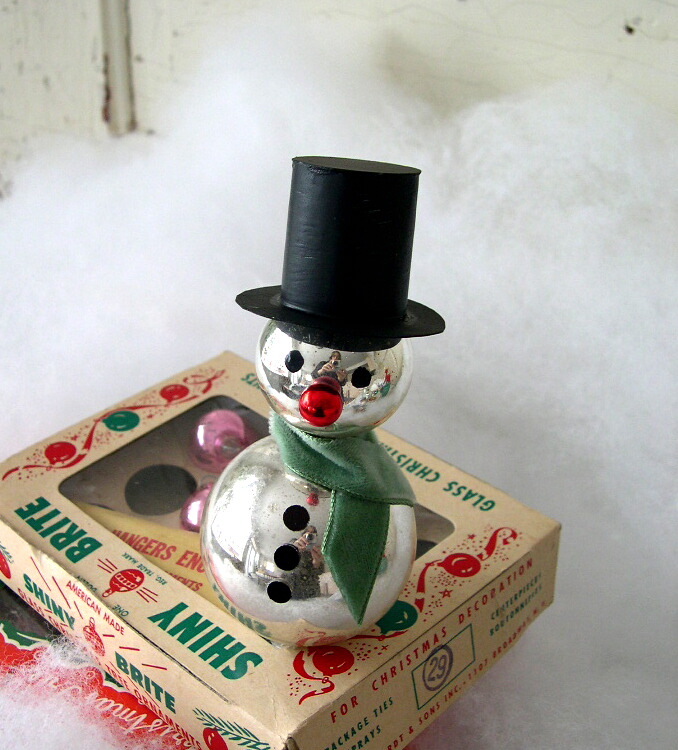 And even though I don't own a glue gun, I was inspired by these vintage crafters to make a little snowman of my own using a couple of the many, many vintage ornaments rolling around here. I built him a tiny cardboard hat and tied on a scarf made from vintage velvet ribbon, adding painted eyes and a vintage glass bead nose. Hope all of your holiday plans are coming along. Pretty snow is falling here today. Yay! What a fun collection of snowmen you have! i am inspired to hunt for more vintage goodies this year. You have very good choice in (snow)MEN! GREAT photos as usual..you have the knack with the camera. Enjoy the snow...chilly and wet here...would not mind a dusting of the white stuff. LOVE all that vintage goodness you've shared. I think the Magpie Ethel sweetie wins hands down for me though. Happy snow watching! Love the snowmen. 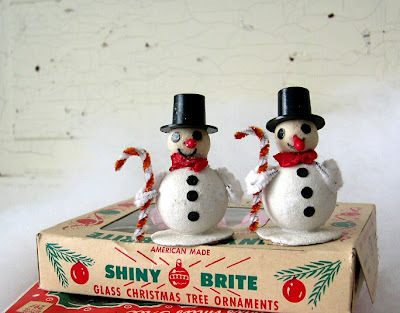 You have some really cute decorations-love the shiny brite box! I love all your sweet snowmen--just adorable! THanks for sharing these...Hope you're having a wonderful Christmas week! 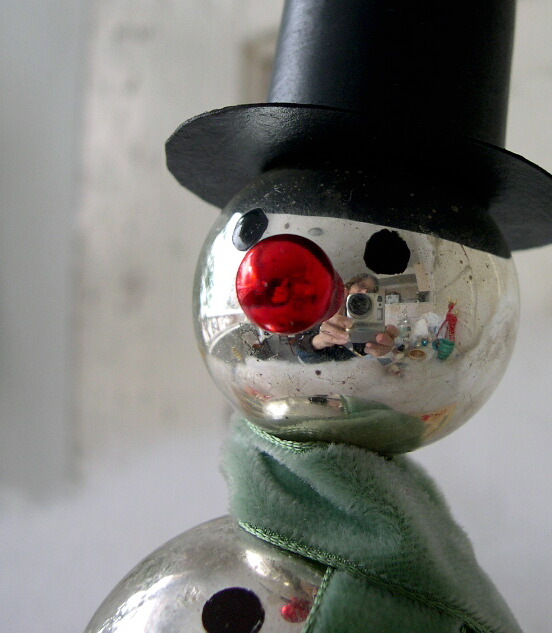 I'm really lovin' the vintage christmas goodness that you have going on there. You've got some great snowmen! I really like the one that you made, without a glue gun. How DID you get it to stay together? It's super cute! I have been following the blogs you mentioned and you guys have me hooked! I bought a bag-o-crap at the Parkrose thrift today just to get the box of tiny little mercury glass bells. I am doomed!!! Jill - I used Gorilla super glue which is supposed to bond anything to anything including fingers to fingers. I have had men fling themselves at me in just the way you described. Thank you for the shout-out; some of your friends braved the crowds and came to the festivities. (All they did was whisper 'Into Vintage' to security and they got front row seats.) I, too, am glue-gunless. I just got the shock of a lifetime, when you admitted that you don't own a glue gun! How in the world did you get that roly poly guy to sit up straight? Did you use duct tape? Anyway, he's very cute, and fits in perfectly with all the other charming creations! Love your little snowman he is really adorable. my daughter just submitted some snowmen to a contest in D.C. and they were published in one of the magazines. Your little guy reminds me of those. He is really cute. Your man collection is super cute. The one you made is just adorable. Good job! They are all so cute...most esp. love the dairy cup one. I'm crafting some snowmen, too...the retro kind...decided to make my own since I can't seem to find the vintage ones easily. That Oodles snowman scene is the cutest thing I have ever seen. In my entire life. The cutest. I also have a thing for the white, stacked little men. I love them because I can keep them out well after the official season is over and they just always put a smile on my face. Cute! Cute! Cute! I love the snowman you made! I get out all my snowmen/ladies for January. So with the after Christmas sales, I might be able to make my own little vintage looking snowman! You are one clever girl. All the things you've made this year should be in a magazine or a book! 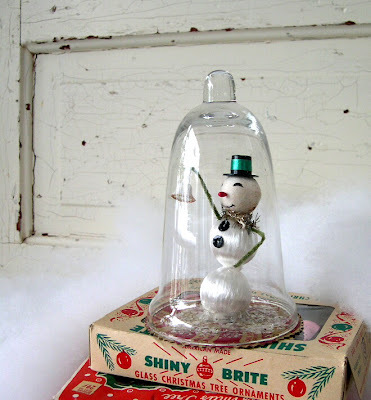 There is just something so magical and sweet about vintage Christmas items! Great find for those snowmen. I have the gnomes - they are made in Japan and were found for .25 at the local five and dimes. Amy, wishing you a VERY MERRY CHIRSTMAS!!! I put a $50 glue gun on my xmas wish list this year cause I'm a getting serious 'bout this wreath biz :-> And did you know there are "commercial" grade glue guns? I know! They must be for "professionals". loving all the cute snowmen :) funny how stuff leaps into the cart eh? Love all of your vintage craft goodies! My holiday displays get better and better with the help of Laurie!! Your blog is wonderful, with so many fabulous posts. I would love for you to come over anytime and join my latest link party!!! PS - Your pin cushions bowled me over, too!